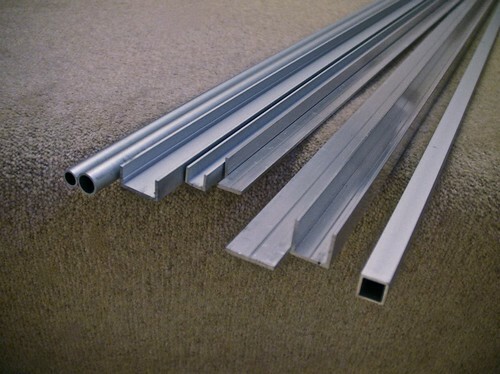 After a quick supplies trip this evening, I've stocked up on some extruded aluminium profiles for projects and general fabrication. Won't go so far as to list them, but as I publish projects I'll include the component specifications and a couple of suppliers for each. The first set of projects on the books is the rebuild of the two new RC vehicles, followed closely with the scratch-build of an RC rock crawler and/or surveilance vehicle using some of the lovely aluminium above. The second set of projects is looking to be based around building a set of sensor arrays for around the house, using Arduino and a range of modules, including ZigBee for wireless communications. After these, or during these, I'll be revisiting the Armatron and getting an Arduino to control it. I started having second thoughts about it, having seen what fantastic condition it's in, and how cool it really is, so I'll be quite conservative in my approach to hacking it. I'm off to work on Ms R's business cards.